This China-Latin America Economic Bulletin is the second annual note summarizing and synthesizing trends in the burgeoning China-Latin America economic relationship. The goal of the bulletin is to provide analysts and observers handy reference to the ever-changing landscape of China-Latin America economic relations, a landscape where data is not always as readily accessible. 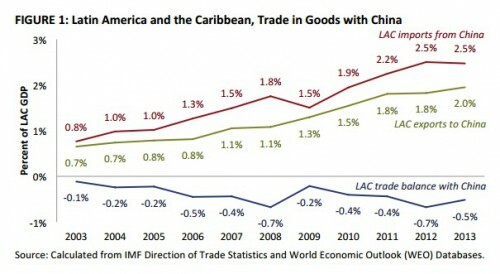 China surpassed the United States as most the important destination for South American exports. LAC exports as a whole to China grew to US $112 billion in 2013 (a record 2.0% of regional GDP), though the region still had a trade deficit of 0.5% of GDP with China that year. China’s policy banks have become the largest annual public creditors to LAC governments. Chinese finance to the LAC region have risen sharply in the last few years, from US $3.8 billion in 2012 to $12.9 billion in 2013 and $22.1 billion in 2014. 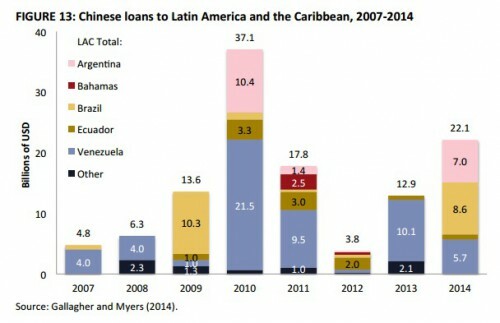 In 2014, Chinese finance to the region was more than finance to the region provided by the World Bank and the Inter-American Development Bank combined. The largest loans have been directed toward infrastructure (including rail and hydropower) and extractive projects. 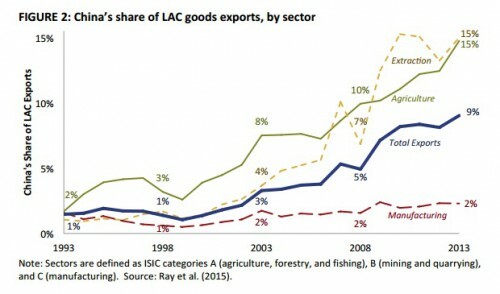 LAC exports to China continue to be heavily concentrated in primary goods. In 2013, China purchased 15% of LAC’s agricultural and extractive exports, but only 2% of the region’s manufactured exports. 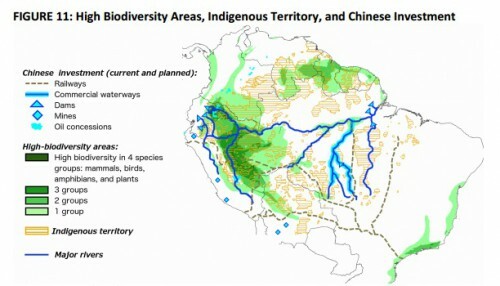 As a result, LAC exports to China support fewer jobs and have a larger environmental footprint than other exports, but LAC has a large share of the world market in their top exports to China (iron, soy, and copper), so there is room to enact necessary social and environmental protections without fear that China will simply switch other suppliers. LAC manufactured exports continue to face stiff competition from China in world markets, though less so than in the early 2000s. 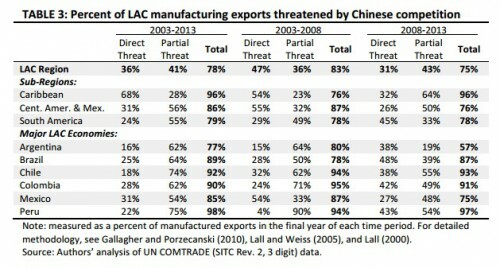 From 2008 to 2013, 75% of the region’s manufactured exports faced a threat from China, compared to 83% from 2003 to 2008. It is unlikely that the reduced threat comes from better labor productivity in the LAC manufacturing sector, because China’s productivity continues to outpace labor productivity in LAC manufacturing. 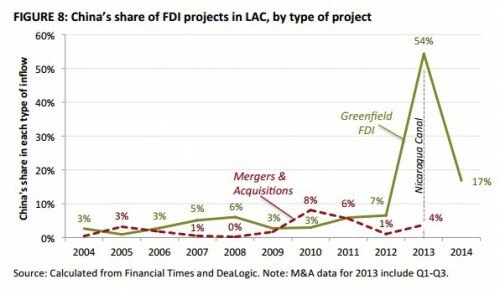 Chinese investment in LAC spiked in 2013, with China comprising over half of new (greenfield) projects in LAC that year. The largest Chinese greenfield project in the last few years, by far, is the new Nicaragua Canal, larger than all other Chinese greenfield FDI projects for the last 5 years combined. Even though 2014 didn’t meet the same record, China accounted for 17% of new greenfield projects in LAC last, more than any other year on record other than 2013. Among mergers and acquisitions projects (M&As, foreign investment into ongoing projects), Chinese investment was overwhelmingly focused on extraction projects, with the oil and gas sector accounting for 69% of Chinese M&A investment between 2009 and 2013 (compared to just 16% of overall M&A investment). Chinese trade, investment, and finance are increasingly associated with significant social and environmental conflict, with some of the most controversial projects about to come on line. LAC exports to China are almost twice as carbon intensive and three times as water intensive than average economic activity in LAC. Many new Chinese investment projects are slated to go through the heart of many globally recognized indigenous and environmentally sensitive lands. The predicted slowing of the Chinese economy is expected to result in a related LAC economic slowdown. It is likely that both directions of trade between LAC and China will slow over the coming years. However, planned Chinese-financed infrastructure and power projects are not expected to suffer as a consequence.